January promises a great start to 2013 for motorsport fans on the Côte d’Azur, with two top rallies taking place in and around Monaco. The 81st Rallye Monte-Carlo, the longest running competition in all rally sport, takes place from the 15th to the 20th January, and once again has the honour of being the opening race in the 2013 FIA World Rally Championships calendar. Valence will serve as the hub for drivers and their teams. There will be thirteen special stages run in the Ardèche, Haute Loire and Drôme, with drivers returning to Monaco for a further five specials in the Alpes-Maritimes. Shakedown takes place on Tuesday 15th January at the Plateau de Lautagne. The Starting Ceremony takes place in the Champ de Mars at 6pm that evening, with all competitors presenting themselves for the competition. Wednesday 16th January sees four special stages in Ardèche, covering more than 130km. On Thursday 17th, there will be three specials in the Ardèche and Haute Loire, which will be driven twice, once again totalling 130km. The programme for Friday 18th January comprises three specials, including two classic Monte Carlo Rally stages which haven’t been run for a number of years – the 22km St. Nazaire le Desert to La Motte Chalancon stage and Sisteron to Thoard (37 km). On Saturday 19th, five stages are scheduled, including three Col de Turini runs, of which two are nocturnal, and two passes through Col St. Roch, one of which is at night. The rally finishes at the Place du Palais in Monaco at 11am on Sunday 20th January, after a gruelling 465 km of racing. 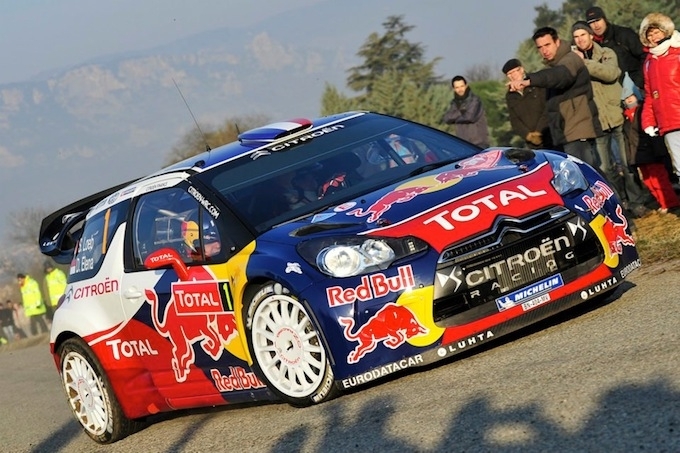 Will we be seeing Sebastien Loeb and co-driver Daniel Elena back on the podium again this year? The roads around the circuit will hardly have recovered when the second rally in as many weeks hits town. The 16th Rallye Monte-Carlo Historique runs from the 25th January to the 1st February, 2013. Competitors this year will once again, as is tradition, be starting from a number of different cities, including Warsaw, Barcelona, Copenhagen, and Glasgow. The rally is open to cars similar to those that raced in the rally between the years 1955 to 1980, with the Selection Committee giving preferential treatment to older models, especially those pre-1966 vintage. Cars are grouped into categories depending on their age and engine capacity, allowing all competitiors the opportunity to shine in their respective classes. The participants will arrive from their chosen cities at Valence, where the rally will be based for two days. The stages here include the legendary routes of the Ardèche and the Haute-Loire, from Burzet to Saint-Bonnet-le-Froid. Further special stages will see the competitors starting at Saint-Jean-en-Royans and finishing with the Col de Corobin. The final section will be a short but intense nocturnal one around the Col du Turini.